Not one, but two finished garments today! For reasons of picture taking efficiency I’m modelling them together. 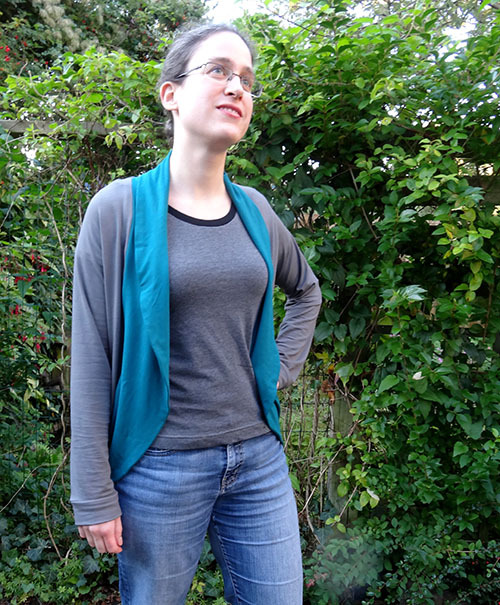 First, the Julia Women’s cardigan from Mouse House Creations. I bought this pattern ages ago but never got around to actually using it until this week. 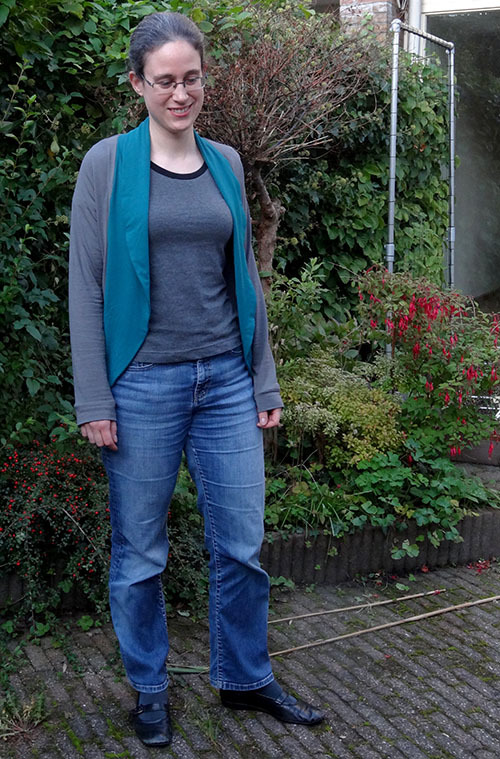 I could use a new cardigan or two this autumn since some of my older ones are getting a bit too worn and this pattern looked like it would be quick and easy. The PDF was fairly straightforward to assemble, I liked that the details that are different for the various sleeve lengths were indicated in colour. The sewing instructions were clear. I chose the variation with long sleeves and the doubled over collar. I made size M at the top and graded to size L at the bottom to ensure that it wouldn’t be too clingy around my hips. The fabrics are viscose knits from my stash. I didn’t have enough left of either colour to make the entire cardigan so decided to make the collar in a contrast colour. I quite like how it turned out and think it will get much wear this autumn and possibly winter as well. Slimming down the sleeves, I find them quite wide at the bottom. There are some draglines in the sleeve at my front upper arm, I’d like to fix this. I’m not entirely sure about the back length, a little bit longer might look better on my figure? 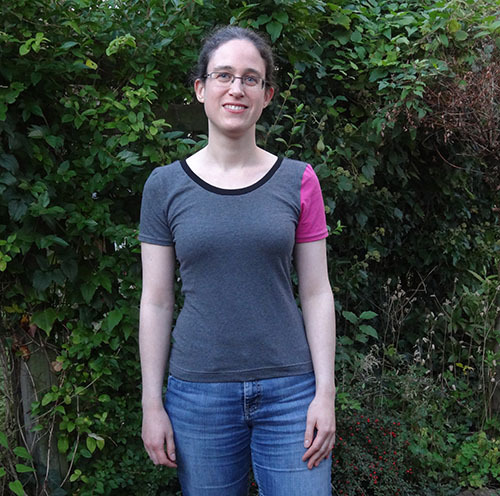 Second, another Lady Skater t-shirt, pattern based on the Lady Skater dress from Kitschy Coo. If you ever wondered what happened to the ridiculous drawstring-detail drape top after I applied my rotary cutter to it, this t-shirt happened. 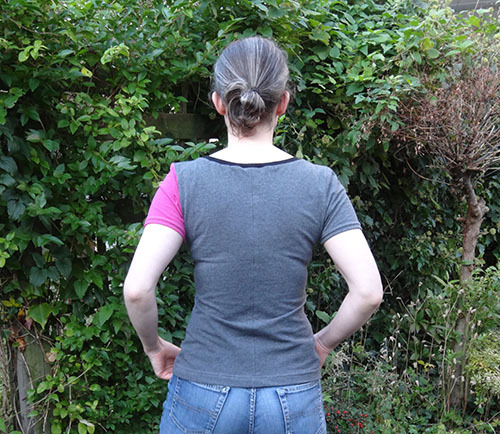 I could cut the back of the t-shirt from the top’s back, keeping the center back seam. The front of the t-shirt and one of the sleeves fit on the drapey front. The second sleeve couldn’t be cut from the drape top and while I did have more of the grey fabric left, I chose to make it pink. Pink is not one of my favourite colours but I like it in small doses. The neckband was cut from black ribbing left over from the Indigo sweater. I think this t-shirt is a lot more wearable than the drawstring top ever was. This entry was posted in Finished project, Sewing and tagged drawstring-detail drape top, garment sewing, Kitschy Coo, mouse house creations, sewing. Thank you. The cardigan is very comfortable to wear too. that t shirt is definitely more wearable than the drapey top! I like the asymmetric pink sleeve, it would never have occurred to me to make just one a different colour. Thank you! That’s a good point about the colour affecting the look of the lenght… Hmmm. After playing around with it a bit, I’m now thinking I’ll make another version that is shorter, but in one colour. That way it will be more like the lenght of my other cardigans. 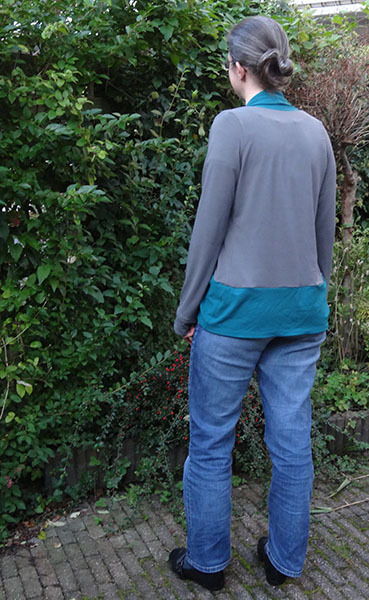 The new incarnation of the drapey top is much nicer and a whole heap more flattering! Love the pink sleeve – I’d have felt compelled to make the neck ribbing match, but then I’m a bit sad that way. 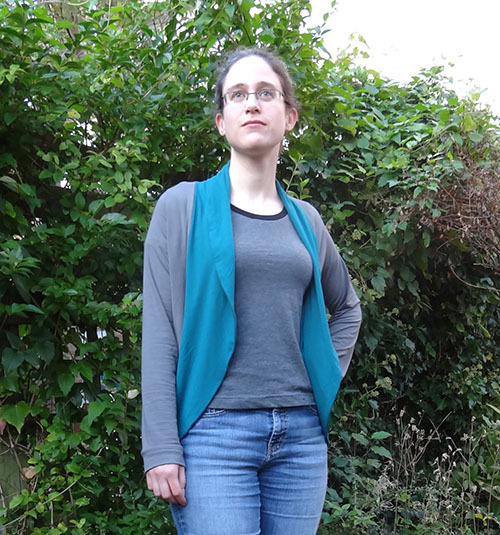 The cardigan is very pretty, and I think it might be worth trying it in a heavier fabric too, for colder weather. Thank you! I considered making the ribbing pink, but thought it would be a bit too much pink close to my face. Well done you ! ! ! That is a great ‘refashioning’ of your drawstring top. I love the pink sleeve – it’s very ‘Boden’. I’m about to make another Lady Skater dress actually because I just love that pattern and I have some fabric that will be perfect for autumn. The Lady Skater dress is great, I still regularly wear the ones I made last year. Love you colour blocked Julia, first I’ve seen like that, and I bet you’ll have inspired a few more to be made! I’ve made one and wear it quite a lot and my sleeves are a bit wide too. 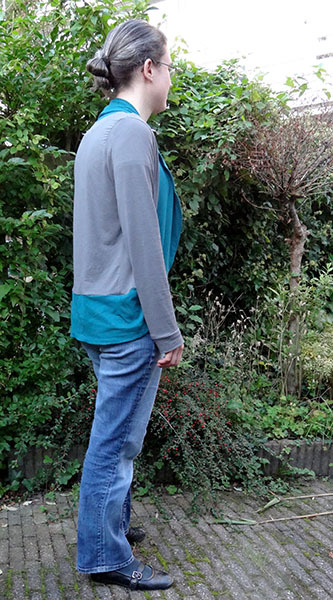 I really like the contrasting colour for the collar of the cardigan, definitely inspired me, hehe! And the pink sleeve on theT-shirt adds fun to it. I found the sleeves quite wide too, so my aim is to narrow them as well. Thank you! I’ve already adapted the pattern to get narrower sleeves but still need to cut the fabric. Will be featured soon, hopefully! Yay! Win on both. They look good together. Thank you! Yes they do, but I like the cardigan even better with something black underneath. Agreed, 100% win!!! Well done! I had to go back and see. Yes, you have much improved upon the drawstring top!